Our Services includes providing self propelled barges in time charter, also provides services for mid sea unloading of Cargo (anchorage discharge) and delivering it to the nearest port. We handle Mid- sea discharging ( anchorage discharge) of dry bulk cargo like coal, fertilizers, project cargoes, sulphur, clinkers, general commodities etc. The services can include lump sum per day charges which will include sea voyage charges, fuel, berthing permission both along-side vessel as well at jetty / port, pilotage. The custom clearance of the cargo, stevedoring, loading and unloading to be in charterer’s account. Flat Top Barges along with tugboat are capable of operating at shallow waters. These Flat Top Barges are without engine and requires Tugboat to tow or push them. 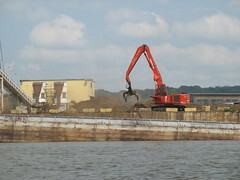 We are service providers for Flat Top Barges required for coastal engineering works. Crawling Excavators also can be mounted on these Flat Top Barges on requirement which can be utilized as for limited dredging / excavation work at shallow water. These barges can also utilize for drilling works, construction or repair of jetty, transporting over dimension cargo, diving works, etc. Ideal for operating at river channels, shallow water where limited draft available, these barges are in high demand. Anchor chains, winches along with skilled operators enables the barge to complete the job works. The barge along with tugboat are capable of supporting cranes, storing material and are available in capacity of 200 MT to 5000 MT and above depending upon requirement. Flat Top Barges with significant deck space and heavy lift capacity makes it more suitable for multiple operations which can be conducted from a single platform. The wide deck space allows installation of wide variety of equipments. The barges are designed and available with engines and without engines. The flat top barges without engines are with low draft and easily able to operate in coastal shallow waters in comparison to the flat top barges with engines. The draft of flat top barges with engines restricts them to operate in shallow waters. The Flat Top Barges without engines are available with pushing / towing tug boat. The pusher Tug boat with the flat top barges becomes a added advantage since the availability of accommodation in the tug makes the maximum wide deck space to be utilized. The barges are safe and with valid permission to operate at harbor and sea. Flat top Barges are secure and work in all weather conditions. Ocean going flat top barges are available with ocean going tug boats and these flat top barges are very useful freight carriers for construction material, project cargo, over dimension cargo, mining equipments, shipping automobiles and heavy vehicles. Flat Barges are the most convenient and economical water transport system. The barges are very useful short distance or coastal transport of bulk packed and project cargoes. Currently flat top barges are mostly utilized for transporting contraction equipments and project cargoes along with general cargo from India to Maldives. Flat top barges are also used for transporting cargo from India mainland to Lakshadweep in Arabian Sea. Flat Top Barges with low draft and maximum free space deck are always preferred by the clients along with derrick or crane. The flat top barges with draft less than 3 mtrs will be the first choice as the discharge of cargo has to be done at shallow water or anchorage. Operating ports are mainly all major and minor ports in south India to all major and minor ports (including the shallow water anchorage) in Maldives and Lakshadweep.